It’s safe to say that for many people Sciatica can be very problematic and also quite demanding. The term sciatica describes the symptoms of leg pain—and possibly tingling, numbness, or weakness—that originate in the lower back and travel through the buttock and down the large sciatic nerve in the back of each leg. The sciatic nerve is one of the most critical nerves in human body and runs from your back, through the buttocks and into the legs. It is also the single longest nerve found in the human body and provides a connection for the nervous system to the entirety of the leg muscles and the foot. It grows out of the spinal fibers and contains mixed tissues from the lumbosacral plexus. Sciatica is a painful ailment that occurs when the sciatic nerve is abnormally compressed or irritated. It can be very tricky to figure out what leads to Sciatica so here are some things to take into consideration. Sciatica can potentially generate pain at any point of the nerve path. Painful sensations can develop all along a path starting at the lower back into the buttocks, through the leg and into to the soles of the feet. 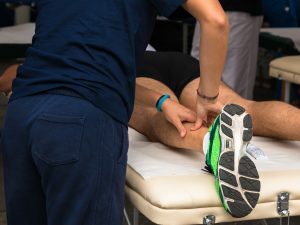 Pain associated with the compression of the sciatic nerve can be described as electrical with a pronounced tendency to cause an intense burning sensation that increases over time. Sciatica is known to cause a marked weakness or numbness in the affected area. Sciatica can make it difficult to stand up or move around. The most common symptom of sciatic nerve compression is a pain that travels from your lower back to the legs, predominantly the backside. This pain can vary in intensity from a dull ache to a severe, sharp pain. However, this will not happen in both sides all the time. You can also feel some pain that comes from the buttock and the lower back and which continues to expand right along the sciatic nerve, a very challenging and problematic thing to deal with. Another common symptom is pain when walking or lying down. This pain typically gets worse when sitting or standing. Searing, sharp pains can be problematic. Shooting or severe pain in one leg can be challenging, and it’s also a Sciatica symptom too. While not all people feel this, it seems that hip pain can also be one of the signs. Again, this is very hard to identify, so it can be a bit problematic in this regard. A burning or tingling sensation down the leg can also show that you have Sciatica. In case you feel a difficulty when it comes to moving your leg or numbness, then you need to do that right away. Lastly, some of the symptoms include pain in the rear side of your body and a variety of other pain types. How can you tell if your pain is sciatica? Sciatica pain is asymmetrical, meaning it rarely affects both sides of the body at the same time. The specific spot of the sciatic nerve being compressed will determine to a significant degree the type and intensity of pain you will feel. Most people with sciatica live with daily pain which over time can significantly impact their overall quality of life. Sciatica can potentially transform your daily chores into insurmountable obstacles. Sciatica pain can clear on its own but more often than not, if left untreated, worsens over time. Therefore it is crucial that we learn to differentiate Sciatic nerve pain from other types of back pain. You experience pain that runs down from the back or buttocks into your legs and feet. You experience pain accompanied by numbness or tingling in your extremities. You experience severe pain down the back of only one leg. As you might have seen from the symptoms list above, sciatica does end up affecting only a single side of your lower body. Pain can end up extending from the lower back and it can go towards the back of the thigh and expand down to your legs. It depends where the sciatic nerve is affected, but that pain can also extend to the toes or feet too. In case you feel that your extremities are weak, you need immediate help and medical attention. But proper prevention and constant support from a medical professional will help you go through this. Sciatica can be caused by muscle spasms, spondylolisthesis, degenerative disc disease and other factors. Thankfully sciatica belongs to the category of conditions that although hard to accurately diagnose are quite easily treatable. For some patients, symptoms disappear over time without any specific measures. To find out the best path of treatment for your Sciatica, contact Chiropractic First today!